Fright-Rags has released new merchandise featuring Dawn of the Dead, Hellraiser’s Pinhead, and the Evil Dead franchise’s Necronomicon. When there’s no more room in Hell, the dead will walk the earth in Fright-Rags’ Dawn of the Dead gear! 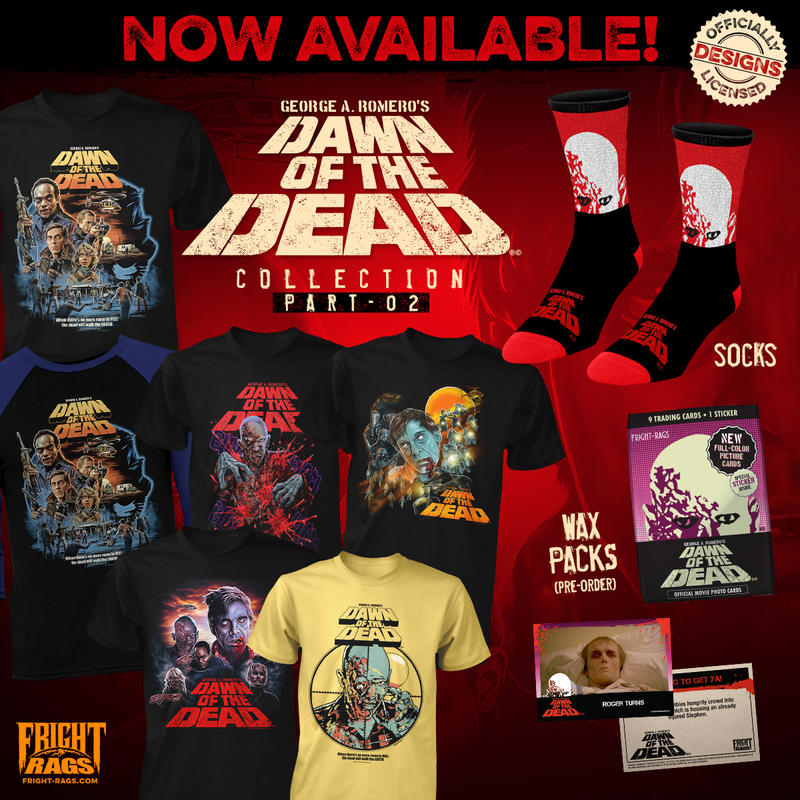 Five new shirts and a pair of socks join several previously-released designs from George A. Romero’s 1978 zombie classic. The company has also created a series of Dawn of the Dead trading cards. Individual wax packs include nine cards and a sticker, with chase and sketch cards randomly inserted. They can also be purchased in limited edition sealed boxes with two complete, 86-card sets and more. Fright-Rags has such sights to show you with its expanded Pinhead collection. The lead cenobite from Clive Barker’s Hellraiser and its many sequels is featured on four shirts and two pairs of socks. Reading is fun with Fright-Rags’ new Necronomicon tee, which re-imagines the Book of the Dead – as featured in the Evil Dead franchise – as a 1970s children’s book. Necronomicon folding enamel pins, pocket notebooks, socks, and a classic shirt design are back in stock as well. Dawn of the Dead, Pinhead, and Necronomicon collections are on sale now at Fright-Rags.com.